Tech start-up company Orion Span says it is ahead of schedule in its mission to offer VIPs an out-of-this-world holiday. 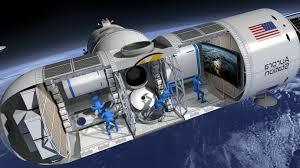 The company is building the first space hotel and expects to complete it by 2021, a year ahead of schedule. It would offer guests the chance to glimpse 16 sunrises, but won't have much of an atmosphere -guests can float in zero-gravity. The hotel will be able to accommodate six guests per trip along with two crew members. Trips last for 12 days and cost a cool $9.5 million, a far cry from Orion Span CEO Frank Bunger's mission of making a stay in space 'available to the masses'. "Upon launch, Aurora Station goes into service immediately, bringing travellers into space quickly and at a lower price point than ever seen before," he said. Still, the company says many people have already paid a waitlist deposit of $80,000 to be among the first space tourists. The Aurora Station 'hotel' would orbit the earth every 90 minutes at an altitude of 200 miles. Orion Span is still crowdfunding to make it a reality and has raised about $200,000 so far. I'd love to experience the trip but wouldn't dare. Would you? Hotel with windows which didn't open! Golf Trinidad Hotel - Is it open? Has anyone booked a hotel that isn`t yet open? Mermaid Hotel, Kalutara, Sri Lanka - Open? ?